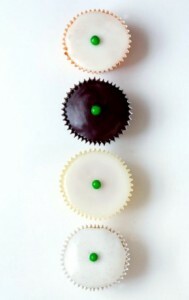 Our Story | Petit Pois Cakes | Have your cake and eat it! Petit Pois Cakes | Have your cake and eat it! Petit Pois celebrates food that is delicious, healthy, and full of fun. Just because something is good for you doesn’t mean that it has to be boring or worthy or taste like sawdust. Thanks to a little imagination and some magic in the kitchen, we’ve come up with a new range of delightful foods that make you feel great. We are launching with Petit Pois Cakes, an extraordinary line of cakes that perfectly captures our company motto: ‘Have your cake & eat it!’ We’ve replaced the butter in our delicious cakes with a most unexpected and secret ingredient – vegetables. Petit Pois cakes have half the calories and fat of ‘normal’ High-Street cakes and are both gluten- and lactose-free. What’s more, it turns out that vegetables improve the texture of sponge cakes by giving them fluffiness, softness, moisture, and a naturally longer shelf life without the use of any hidden ‘nasties’. Because you can’t taste the courgette, pumpkin or beetroot inside Petit Pois cakes, you would never guess they were made from vegetables in a million years. Petit Pois cakes are sold in boxes of two different flavoured cupcakes that complement each other: Chocolate & Vanilla, Lemon & Orange. The recipes were developed in Harry’s kitchen in Paris and are made by a family bakery in Wales using the best quality, natural ingredients available, including 70% chocolate, Madagascan vanilla extract, freshly grated lemon and orange zest, and free-range eggs. Rather than smother the cakes in a mountain of hot pink icing, we’ve designed Petit Pois to be chic and simple: each cake has a thin layer of icing and is topped with a little green pea. The green pea signals that these are the cakes that are good for you.